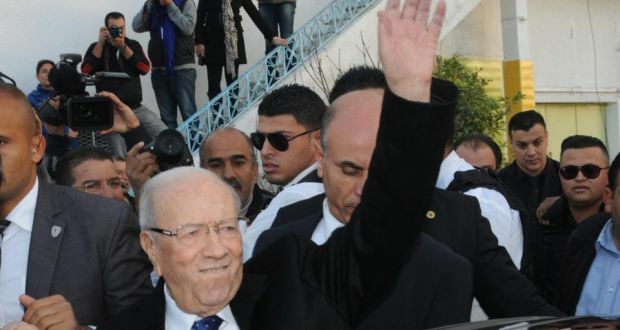 Beji Caid Essebsi has been confirmed as winner of Tunisia’s first free presidential poll. The veteran politician secured 55.68% of the vote in Sunday’s run-off, defeating caretaker president Moncef Marzouki (44.32%), the head of the electoral commission said. Moncef Marzouki, a 67-year-old former exile, earlier refused to admit defeat. Beji Caid Essebsi, 88, has urged all Tunisians to “work together” for stability but critics say his win marks the return of a discredited establishment. They point out that he served under President Zine el-Abedine Ben Ali, who was ousted in 2011 after the Arab Spring revolution triggered uprisings across the region. Beji Caid Essebsi was also in the cabinet of Tunisia’s first post-independence leader, Habib Bourguiba. Earlier on Monday, police fired tear gas in the southern city of Hamma to disperse hundreds of demonstrators who burned tires in protest at Beji Caid Essebsi’s victory. The results of the run-off vote were announced by the head of the electoral commission, Chafik Sarsar, who was visibly emotional. It is the first time Tunisians have been able to vote freely for their president since independence from France in 1956. Moncef Marzouki earlier criticized Beji Caid Essebsi for declaring victory based on exit polls. Moncef Marzouki has been interim president since 2011 and is more popular in the conservative, poorer south. He was thought likely to attract support from the moderate Islamist Ennahda party, which has played a key role in Tunisian politics since the Arab Spring but did not field a candidate. “I thank Marzouki, and now we should work together without excluding anyone,” he added. Supporters danced and let off fireworks outside the headquarters of Beji Caid Essebsi’s secular-leaning Nidaa Tounes party.